What do travelers look for when they shop for a hotel? Well, that depends on the type of trip they plan. Is their trip business or leisure related? Each of these types of travelers are distinct and have different priorities in mind but never the less, there are similarities between the two; so much so that the business traveler can become a leisure travelers and vice versa. When people travel for the experience, they seek entertainment and vacationing while the business traveler’s purpose is a focus on work. But a trend is for business travelers to take a few days before or after their work-related event to explore the place they are visiting. In this instance, the business traveler become the leisure traveler and wears both hats. The same can happen in reverse. A leisure traveler might not have work in mind but might branch off to expand their activities to include a short seminar or a visit to a location that may be beneficial to their learning in relation to their businesses or job. 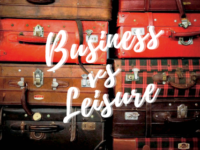 Although leisure accounts for approximately 70% of all travel, there are connections between these travelers and the other 30% who make up the business travel sector. A big priority for both traveler types is location. Each traveler, regardless of the motive for their trip, is looking to be close to the location they are visiting. Business travelers often seek out hotels near convention centers while tourists seek proximity to local attractions. Often, a central location attracts both travelers since there is a short distance to key destinations in the surrounding area. Besides location, transportation is another appealing feature of hotels catering to both types of travelers. Each traveler might be arriving to your hotel in a different manner: plane, rental-car or train but, they all have transportation needs once they arrive at your door. Weather it be catching a shuttle to and from the airport, finding a last minute taxi or simply directing them to the nearest form of public transportation, your hotel can appeal to business and leisure travelers alike by providing accessibility to easy transportation arrangements, or at the very least hotel parking. Another interest for travelers is loyalty programs. Companies sponsoring business trips look to rack up points from the multiple people they send to each venue. Similarly, adventures looking to save money or earn rewards look for hotels that offer the best frequent-traveler programs. Additionally, some amenities appeal to both leisure and business travelers. For example, both groups have a high interest in having internet access in their hotel room. Business travelers need Wi-Fi to be able to work on power points and search the web for information regarding work while leisure travelers will likely want internet access to post photos of their vacation online to impress their friends and families on social media. Guests posting about their experience is important because there are benefits of user generated content which can be used to your advantage since travelers may post pictures of your hotel. Having internet access will be appealing to most travelers regardless of why they are surfing the web. Other amenities that appeals to leisure and business travelers are having breakfast and coffee readily available. Both types of travelers have busy days ahead of them and offering a snack or a meal may get their day started off in the right foot. Have breakfast available at the hotel can save time and help some someone avoid being late to a meeting due to having to stop for coffee. Similarly leisure travelers would like to maximize their time to see attractions and explore the area, the do not want to spend time seeking out a restaurant before they even start their day. Providing a simple continental breakfast or coffee can save both types of travelers valuable time. By getting them what they want, your guests will be happy to return to your hotel in the future. Overall, these two segments of travelers have different things in mind when booking a hotel but, you can accommodate both. Portraying your hotel with the characteristics that both travelers need will help you win over the business of an array of travelers if you play your cards right.